The light from the lamp does not flicker or cast a shadow. This is a tremendous help because my eyes itch and ache at the end of the day. Yup they get tired. 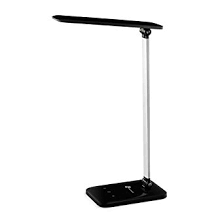 Books are very easy to read using this light and that is important to me. The light does seem to make my double vision less pronounced. When the lamp is used in the bedroom the light does not spread around the whole room plus it is easy to adjust the position of the lamp. I have something very similar, but a different make, and I share all your comments but would add the ease of switching – on and off – for my troubled fingers. Delightful, touch sensitive, buttons. There is even one with a picture of a cup of coffee on it. Apparently there is quality of light for coffee drinking! Its the quality of light that I really like. Also agree that turning it off and on using buttons on the base is so easy but idea of coffee-light is a bit far fetched.